The stillness of the stream or pond is suddenly shattered by a sound which resembles a kid kicking a can full of rocks, a drawn out rattle that shatters the solitude like a clap of thunder. 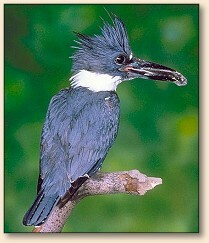 The Belted Kingfisher has made his presence known to one and all. The Belted Kingfisher is a medium sized bird, about 12 inches long, with a heavy black beak and jaunty top knot which gives them a "big headed" appearance. Both the male and the female are blue and white. The male has a single blue band across his white breast, while the female has a rust colored band beneath the blue breast-band. They are found throughout North America from Alaska to Florida and are common around streams, lakes and ponds across the country. Belted Kingfishers nest in burrows that they customarily excavate themselves. These are usually dug in a sandy, clay or gravel bank along a body of water. Where suitable nesting sites are not adjacent to water, Kingfishers may build their nests a long distance from water. The burrows are normally 3 to 6 feet long, but burrows over 15 feet long have been discovered. These burrows are used repeatedly, so a nest site that is in use this season will likely be used for several more years. The actual nest is placed in an enlarged chamber at the end of the tunnel. The birds build no actual nest, but the nesting chamber is often lined with fish bones, fish scales and shells of crustaceans which the birds have eaten. Belted Kingfishers feed mostly on small fish that they capture by diving, head first, into the water. While fish make up the main part of their diet, they also feed on crabs, crayfish, small amphibians, snakes, insects and small mammals. Like owls, kingfishers disgorge pellets consisting of the indigestible portions of their meal. These small, whitish pellets can be found near their nesting burrows or under favorite perches. Belted Kingfishers have favorite perches that allow them to observe the activity of their prey, and these perches are often jealousy guarded by the resident kingfisher. Where suitable perches are not available, they will often hover over the water like a hummingbird. Kingfishers prefer clear bodies of water that are free from excessive weed growth. Once a victim is located, the kingfisher hurls himself head first into the water. If he is successful he will return to his perch with his prey held securely in his beak. Then he will smack the fish soundly against the branch, often several times. Once satisfied that the fish is dead or thoroughly tenderized, the kingfisher will flip the fish around and swallow it head first. If the fish is too long to swallow completely, the tail may remain hanging out of the beak. While kingfishers normally prey on small fish, they rarely represent any significant dan­ger to healthy trout populations. 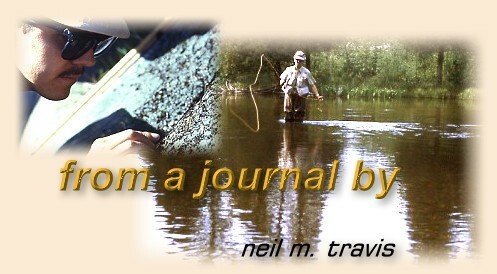 Studies have shown they chiefly consume rough fish, but they do feed on trout and salmon when available. In hatcheries they are a particular problem, but this is easily overcome by covering the raceways with screen or netting.